March 15th 2019 – Looking at the weather forecast this morning tells me that we are in for a bumpy ride next week starting Tuesday afternoon. Maybe our last cold front here in Key West and a shot at one more temp swing in our water temps to sort things out for the fish and draw the line, maybe, between winter and summer. Im not a meteorologist nor a fortune teller but the trends tell me this might do the trick. 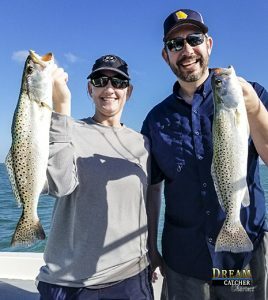 Nice catches of sea trout like these are a daily occurance here on our trips at Dream Catcher Charters. The backcountry fishing has held pretty solid. Usually this time of the year we start to get some stronger high pressure winds from the East to kick off our early tarpon season with the big boys of March. This was sparked last month a bit but since has since settled down. There has been good tarpon fishing the last week or so but nothing like what we have seen in the past for March. Keep up on my tarpon fishing reports to stay informed.. Even with the water warming up faster than usual the trout bite has stayed strong with some Spanish mackerel and lots of jacks followed by lady fish and sharks to round out the species of characters one can expect. On the flats we are getting lots of shots at nice sized permit for anglers that have the patience to try it. There has also been some good sized barracudas ready to pounce on a fast moving bait.. The front on Tuesday is imminent. Its gonna blow and chill us a little. Air temps to the mid 60s and water temps may get back down to the upper 60s for a day or two. This will chill our fish for a tide or two as they acclimate. After that it should be Game On! A high pressure will establish over the Eastern Seaboard making brisk Easterly winds here in Key West and setting our March tarpon fishing on fire into the following week. If you would like to put a fishing charter together give us a call..